I thought I would change things up a bit (I am itching to go skiing again this season!!). Hope you like it. It was very dark and extremely windy that night! Watch this eerie dark trip down a run at Brighton Ski Resort in Utah. Windy like a blizzard. That’s my dad skiing ahead – I used my tripod as a stabilizer. HDR-like color correction in Premiere. I shot in these blizzard conditions with my 7D, Canon 17-85mm IS lens, Olympus Zuiko f1.8 50mm manual lens, H4n, and Redhead windscreen for approximately an hour. During that time, I changed lenses in the snow and the 7D had no problems. The LCD screens on both the 7D and H4n were ghosting, but were still fully functional. The temperature was around 20º. When Michael's not working on a client project, he's either taking photos, playing the piano, or woodworking. Currently the Owner at DeVowe Creative Works and volunteer firefighter in Medina, MN. If you find an article or post interesting, feel free to leave a comment – We would love to hear from you! 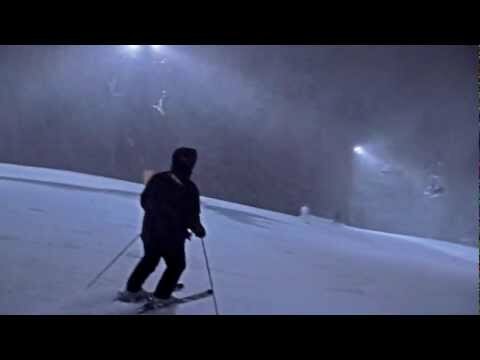 Skiing at night is really an exciting activity. I have tried this last month and I was surprised because I have realized that it is more enjoyable than skiing at daytime. Thanks for these ideas. You really need some spy movie music for this one. Your arm must have gotten tired by the time you got to the bottom of the hill. Haha, that would probably sound pretty good here! My arm wasn’t too tired on this one. Another hill at another resort took me 12 minutes to get down – my arm was tired on that one! Thanks for watching and taking the time to comment!